Former President John Dramani Mahama, has urged delegates of the party who will be voting in today’s national executive elections to vote for competent and trustworthy leaders who will be able to help the party wrestle power from the New Patriotic Party government. In his goodwill message on Facebook ahead of the elections, he said that NDC cannot afford to fail Ghanaians by electing incompetent executives who will not be committed to the party’s election 2020 victory agenda. The people of Ghana are ready and willing to change the negative course in the 2020 elections. We, the NDC, cannot fail them! To end this hardship by winning emphatically the 2020 elections, we must elect National Executives we can trust. Executives who are hardworking and committed to the noble Victory 2020 agenda, Mahama advised. 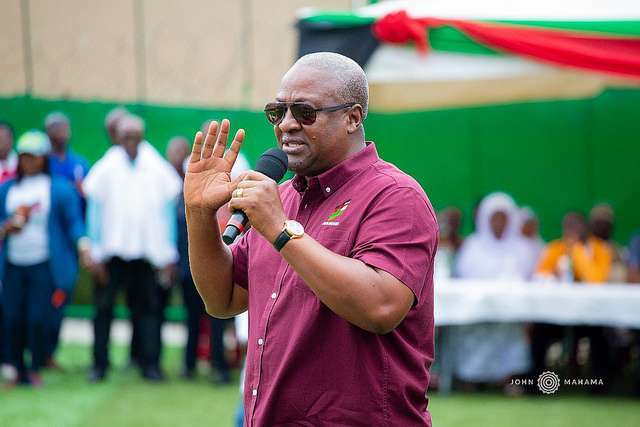 John Mahama, who is seeking to lead the party as flagbearer into the 2020 election, cautioned the delegates not to be swayed by material gifts that may be given to them to influence their votes. Do not allow yourself to be influenced materially to decide your vote. We must elect an executive that is trustworthy, competent and in which our diverse membership all have a stake, he warned. I have over the past few weeks criss-crossed the country and visited your constituencies with my campaign to lead our great party, the NDC, to victory in 2020. To end this hardship by winning emphatically the 2020 elections, we must elect National Executives we can trust. Executives who are hardworking and committed to the noble Victory 2020 agenda. Do not allow yourself to be influenced materially to decide your vote. We must elect an executive that is trustworthy, competent and in which our diverse membership all have a stake. God grant us journey mercies as we converge at the Trade Fair Centre in Accra as one big Akatamanso family for our 9th National Delegates Congress. The national delegates’ conference of NDC is set to take place at the Trade Fair Centre, La, in the Accra. A total of 9,530 delegates are expected to choose the men to manage the affairs of the party in the upcoming years. Police have said about 300 personnel will be deployed to the venue to help maintain law and order.